LDM301-302 Laser Distance Sensor - HiTECH Technologies, Inc. The new LDM 301 Laser distance sensor measures distance and speed of natural targets without a reflector, but a reflector can be used for increasing the measuring range. The sensor needs only a very short time to measure; it facilitates distance measurement to or from moving objects. 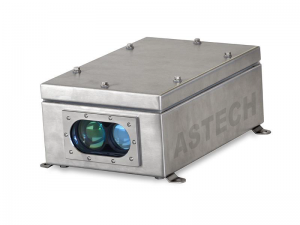 The laser pulse’s time-of-flight measurement principle which it uses is specifically suitable where great distances have to be measured and for applications in harsh industrial environments. With the compact design shape, simple setup and configured with standard interfacing facilities, the LDM 301 can easily be installed. For interfacing an analogue output, 2 digital outputs and a serial interface RS232 or RS422 are available. 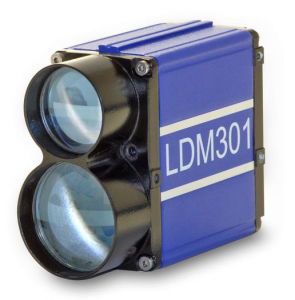 Standard LDM 301 includes integral heating, a status display and a red Laser pointer. A modular setup allows for easy complementation with accessories or special models as may be required in particular applications.